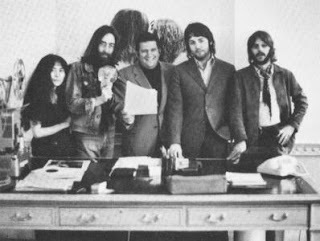 Former Beatles & Rolling Stones mega business manager Allen Klein passed away after a battle with Alzheimer's disease, he was 77. 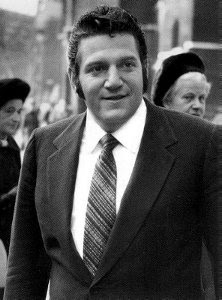 Klein was a ruthless business manager who was almost like a gangster with his style of bullying record companies. The New Jersey accountant started out representing music stars like Bobby Darren, Connie Francis & Sam Cooke in the early sixties. Getting them royalties owed to them and collecting half the profits. He moved onto the British Invasion groups in the mid sixties; the Animals, Dave Clark Five, & Herman's Hermits. He landed the Rolling Stones who had originally signed on to a bad contract. Klein got them a much better deal by bulling the record company for bigger percentage of the earnings. Klein got a share of 20 % which Keith Richards called " the price of education". Eventually the Stones felt Klein was getting two much & wanted out. The only way out was giving him ownership of some of their biggest songs. By this time the Beatles Apple Company was in shambles. After their manager Brian Epstein died, they tried to control the business end of things but they needed help. Klein was now considered a giant in the business and John called upon him. The constant arguing among the Beatles, got worse when Klein jumped on board. Lennon, George & Ringo all wanted Klein to represent them, but Paul wanted his new father in law to represent him, Lee Eastman. Eventually the Beatles broke up and the legal mess went on for years. 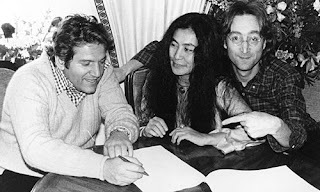 In 1970 Klein's ABKCO Company bought publishing rights to many Beatles songs. The court battles, and suings went back & forth, by 1977 the deal was dissolved with some 4.5 million going to Klein. Klein's company ABKCO is one of the largest independent labels in the world. It owns rights to some music by the Rolling Stones (pre 1970), the Kinks, The Who, The Ronettes, The Animals, The Crystals, Sam Cooke, Herman's Hermits, Marianne Faithful, Bobby Rydell, Chubby Checker, ? & the Mysterians, Dee Dee Sharp, Righteous Brothers, Cameo Parkway Records & the Phillie's Sound label. It estimated worth is eight million dollars. Klein's three children will be taking over the company based in New York.